Marijuana Seeds, Bongs, Pipes and Chronic Weed Reviews! Feminized cannabis seeds are awesome for if you want to take the gambling out of growing your own pot. The particular feminized cannabis strain I’ve selected is this new one from Nirvana Shop, Kaya. Kaya is a great weed plant for if you don’t want a whole lot of hassle, or if you’re new to indoor growing. That being said, Kaya makes a good outdoor plant as well. As the guys at Nirvana Shop say, this is a good one for just leaving out in the woods and coming back for it 9 months later. Kaya has a strong earthy smell, and a very well rounded cannabis strain. This weed plant produces quite a big bud with dark orange hairs. But the best part about Kaya is how hardy this strain is. It can handle a few bugs and is also less sensitive to changes in its environment than most other cannabis sativa varieties. If this is your first time trying to grow your own pot, I would definitely recommend picking up 5 or 10 seeds of a plant like Kaya. The fact that these seeds are feminized means that you won’t have to throw a few away when they turn out to be males. Every Kaya seed is guaranteed to germinate and produce night fat weed buds. At Nirvana Shop you can get hold of 5 or 10 feminized Khaya seeds. If you’re planting outdoors in the woods I’d suggest getting 10 seeds. If you have a really small grow room maybe only get 5, cos these ladies can get pretty big! It’s a question that leads many stoners to these pages: what do I do if my marijuana plant has bugs? It’s a tricky one, because the yield and THC content of your plants are very sensitive to chemical balances. Bugs change this balance, but on the other hand so do chemicals to kill bugs. The obvious answer is: go organic. I personally believe that the first line of defense should be garlic extract. This does nothing to your plants and it has a good chance of killing some or all of the bugs on your weed plant. If this doesn’t work, you’re going to have to bring in the bigger guns. Spidermites are the most likely bug to infest your weed plant. You can spot their eggs as tiny black dots (REALLY tiny, like if they were any smaller you couldn’t see them) on the underside of the leaves. To kill these suckers, you’re going to have to buy something. I recommend Spidermite Control from The Grow Shop because it’s cheap (€12,61), totally organic and does the job even if your spidermite problem is out of control. Fungi can also be a problem for your weed plant. Unfortunately, once fungi sets in you can only really limit its spread. However, there are some leaf sprays that you can use that also double as nutrient sprays. I found this one, Leafcoat, for only €7,16. Totally organic, prevents fungi, scares away bugs and promotes THC production. Definitely a good buy. The bottom line with bug control in weed plants is that prevention is better than cure. I would definitely recommend picking up some of this leaf coat stuff at The Grow Shop, before bugs become a problem. Hindu Kush is one of the world’s oldest cannabis indica strains, and it has a rich, rugged history. It is believed that Hindu Kush was the first cannabis strain brought back from the ‘Orient’ to Europe by explorers, hundreds of years ago. Since then Hindu Kush has remained largely unadulterated, and is only occasionally bred with plants like White Widow to add potency and its rich, exotic flavor. Despite its ancient origins, modern Hindu Kush strains are best suited to indoor growing. The Nirvana Shop have engineered a ‘Master Kush‘, which combines the best elements of Hindu Kush and potent sativa strains. Master Kush is an excellent plant to grow indoors, as it stays short but produces high yields (around 400g per square meter sea of green). The taste is earthy and spicy, and the smoke feels a bit like hash on the lungs. The high you get is a powerful body buzz that starts in the temples and moves down, making your whole body tingle. Lasts for hours. This brand of Hindu Kush is rich in THC (up to 20%) and flowers in as little as 7 weeks. It is relatively easy to grow, provided that you give it the respect it deserves. When you grow and smoke Hindu Kush you become part of a history that is much bigger than yourself, and that’s something to think about when you’re puffing away. You can buy Hindu Kush Seeds from The Nirvana Shop’s indoor section for EUR 25.00 – the best price on the net! Hindu Kush not quite your cup of tea? Check out some other weed reviews. For a basic look at what you need to grow outdoor marijuana, take a look at the post What Do I Need to Grow Marijuana. What follows is a look at two or three chemicals or organic solutions you need to grow marijuana successfully. These are not entirely necessary – you can just stick some cannabis seeds in a pot, water every 2 days and wait for it to mature, but you probably won’t produce a lot, and it won’t really be worth smoking or the effort you put into it. It’s really easy, and pretty cheap, to go the extra mile and grow the best marijuana plant you can. The first thing you need is something to promote vegetation (the first stage of the plant’s growth). In outdoor plants, vegetation can take anywhere up to 3 months. The next thing you need is something that stimulates the flower growth – this will affect your marijuana yield. To get started, what I’d recommend is picking up one of Nirvana Shop’s Germination Kits These are little sphagnum peat moss tablets that protect your seeds and provide them with all the nutrients they need for proper germination. They give your ladies the best possible start in life, and at 9 Euro, they’re well worth the extra few bucks. Lastly, you will need something to combat bacterial infections and bugs. This can vary, but as a first line of defense I would say try garlic extract sprayed onto the leaves before you go spending any money. All of these products to grow marijuana can be found at Nirvana Shop, the internet’s best resource for hydroponics, solutions, and anything else you need to grow marijuana. If you sit down in a coffee shop in Amsterdam and you order a spliff without specifying what ganja strain you want in it, chances are you will get PPP or something like it. ‘Pure Power Plant‘ was developed from potent South African indica and sativa strains to be both a great smoke and a good crop. It grows voraciously outdoors, but it can also be grown indoor. These buds can sell for top dollar, and produce an intense all-over buzz with distinctly high characteristics. The taste is slightly sweet, with a very pleasant pine aftertaste. A square meter of PPP plants will yield up to 500 grams of potent marijuana, all in as little as 8 weeks! PPP has a high THC content (15-20%) and produces a lot of pollen if you like to collect off your buds. PPP is definitely a social weed, good for parties and any occasion where you can’t just veg in front of the TV. You can buy a packet of 10 PPP seeds from the White Strains Section of the Nirvana Shop. I would seriously recommend giving this one a try! Is Your Drug Test Ordered by a Court? Flushing is basically drinking a lot of water before your test. You will need to drink a lot of water in order bring you down below the cut-off, and this presents a problem. If your urine is too pale it will arouse suspicion. Solution? Take vitamin B-2: it tints your urine yellow. There are a wide range of products on the market that will flush your system of toxins. These products can work in passing urine tests, but their use is illegal in many cases. You can check out the Pass a Drug Test How-To, which is a wiki for how to pass a drug test, to find out about whether you will get into less or more trouble for using one of these products. Otherwise, check out passingpisstests.com where you can find loads of good detox products that guarantee that you will pass a drug test or your money back. Hair drug tests are becoming more common, but there is a way to beat them. Follicle shampoos can be used to wash off the particles that a hair drug test looks for. However, they can also be detected. What if I’m Getting a Drug Blood Test? In a word, you’re buggered. There’s not a lot you can do to tamper with your blood. Besides, if you are being subjected to a drug blood test chances are it is because you are a repeat offender or you have fooled other drug tests and been caught. Good luck with that one. Remember, there is no sure way to pass a drug test without some risk of being caught. Being caught for using adulteratives, flushing or otherwise tampering with your sample can lead to even bigger trouble. Consult the Pass a Drug Test How-To if you’re not sure about using a product or method to pass a drug test. Potent Chronic Weed Seeds on Special! It is possible to grow Jock Horror seeds outdoor, but this cannabis strain is best grown indoor using hydroponics. Weed like this grown properly in hydroponics will be some of the best marijuana you ever smoke. Jock Horror is one of the best cannabis strains out there, but not a lot of people know that it was originally derived from genetically modified super-mutant medical strains. The effect is a total lack of negative side effects like paranoia, tiredness or the munchies. If these are some of the reasons you smoke marijuana, maybe this isn’t your herb. On the other hand, if you like a fine creation of man and nature rolled into one big spliff, Jock Horror is your ganja. Jock Horror seeds are some of the easiest weed seeds to grow, if you know how to grow marijuana indoors. If you have yourself set up, order these seeds right away! They take between 9-11 weeks of flowering to mature (shorter by a week or two than the original Jack Harrow), and produce a moderate yield of highly potent marijuana – up to 20% THC content! You can order Jock Horror marijuana seeds from The Nirvana Shop under the Medical Seeds section. I’ve done a lot of shopping around and The Nirvana Shop Cannabis Seedbank is by far the cheapest place to buy weed seeds. Don’t pay over $100 for a bag of seeds that aren’t even guaranteed to germinate! These weed seeds usually go for $29.61 per packet of 10 seeds, but you can buy Jock Horror seeds at Nirvana Shop at ridiculously low prices! This is by far the best deal you’ll find this year on some high quality sticky green, so go for it! If you’re picky, you can also get 100% feminized Jock Horror Seeds. They’re a little more pricey, but 10 feminized Jock Horror seeds costs about as much as 10 regular seeds of anything else you can find. THIS SPECIAL IS ONLY VALID UNTIL THE END OF OCTOBER! Your Marijuana Habit Can Make You Rich! You like to smoke marijuana right? That’s why you’re here, isn’t it? You came because of the bongs, pipes, marijuana grow tips and to decide whether or not you wanted to buy cannabis seeds online. Oh, and you smoke all the time, don’t you? All you need to do is put small banners on your website, email your friends about Grass City products and wait for the cash to start rolling in. You earn a commission on every sale – and it adds up, trust me! The best part is, it’s totally legal! You won’t get into any trouble because the weed, bongs, pipes and seeds are marketed as souvenirs, and you don’t touch the products. It’s easy and fun, and the best part is you get to blog about marijuana and bongs and make good money from doing it! All you have to do is click here to sign up, put a few banners on your blog and tell people about the store. Then you wait for them to buy and you make cash! Hawaii x Skunk #1 is a blend of one of America’s most loved cannabis Indica strains, Maui Waui, and the most potent skunk available (in this case Maui Waui). 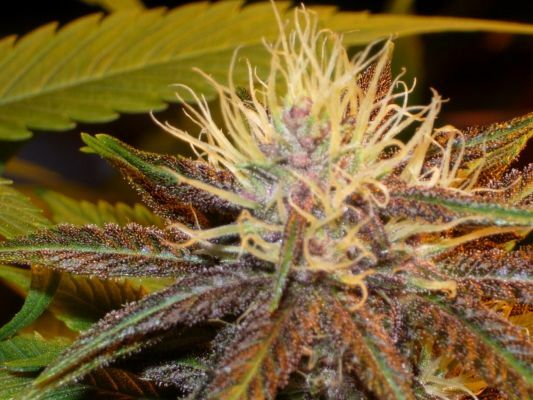 The effect is truly mind-blowing, and the best part is, you can grow this skunk outdoor! Hawaii x Skunk #1 grows tall and bushy and produces large leaves and big buds. Flowering time is cut down to 7-8 weeks because of the introduction of the Skunk genes, but this has not seriously affected the quality. THC content is still running strong, between 15-20%, and the high you get is distinctly up, and definitely a body thing. You can feel the top of your head start tingling from the first puff of weed smoke. The flavor is rich and pleasant – Hawaii x Skunk #1 lets you know you’re smoking weed! As with all indoor/outdoor Indica/Sativa crosses, this weed plant is relatively easy to grow, very resilient to bugs and infections and will produce a potent yield (around 450 grams per square meter sea of green). Buy Hawaii x Skunk #1 Seeds at The Nirvana Shop. All Packets contain 10 seeds and are sent discretely – you cannot be connected to The Nirvana Shop. Customers’ Reviews generally claim a delivery time of around 10 days after being shipped, wherever you are in the world. Interested in Growing Outdoor Marijuana? Check out What do I Need to Grow Outdoor Marijuana? And All the other posts in the Weed Reviews category – Choose your smoke wisely! Grapefruit is a cannabis indica strain directly derived from the original “chronic”, if my sources are correct. It sounds delicious but in actual fact it has a rather neutral flavor, with hints of citrus here or there. Grapefruit was a very smooth toke, but at first I thought it was a lightweight. It came on slow, but after about fifteen minutes I could tell that this was some excellent cannabis indica. With a THC content of 10-15%, grapefruit is subtle but potent. The high was a distinct indica body buzz. From a grower’s point of view grapefruit chronic is a very low-maintenance plant, but it must be grown indoors. It produces a relatively low yield (400 grams for a 1 square meter sea of green), but it finishes flowering in under 9 weeks. It is very resistant to bugs and infections and will produce good chronic even under semi-optimal conditions. A very good plant for first time growers! The only place I’ve found where u can buy grapefruit chronic seeds is The Grow Shop. They call it Jacky White, but it’s the same plant. 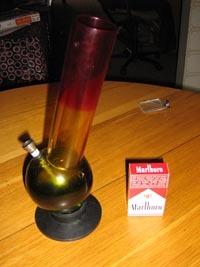 Many experienced bong smokers claim that glass bongs are the only way to go, but a lot of acrylic bong owners hold their bongs up high and sing their praises. Let’s have a run down of the perceived merits and flaws of acrylic bongs and glass bongs. The bongs featured here are all from Easy Bongs, the cheapest online bong store. -Tend to be a bit harsh, especially the big bongs. -Break easily, especially when cleaning in hot water. Keep away from all but your most trusted friends! So What’s the Verdict on Glass vs Acrylic bongs? As you can see, it’s a simple acrylic bong. Glass bongs might cost about the same, but they break too easily for me! This bong is a good smoke, and it’s always reliable. Doesn’t get clogged and is easy to clean. It’s called Grapefruit, and if you want to find out if this little bud of mine is any good, why don’t you check out my Grapefruit Weed Review! All of the bongs featured here are available from Easy Bongs, and the Grapefruit Indica seeds are available from The Nirvana Shop . Color changing glass pipes are something every stoner should have in their arsenal. They’re great to whip out at a smoke up, and everyone always wants to have a toke. So how do they work? Color changing glass pipes typically have a clutch or air hole, just like a bong. The entire color changing glass pipe is hollow, allowing a large amount of smoke to build up inside before being released by taking your finger off the clutch hole. There is one thing to know about color changing glass pipes: they aren’t exactly sturdy. Make sure you pick up a good case for your color changing glass pipes and always keep them in their case when not using them. I’ve broken way too many glass pipes by throwing my bag around. 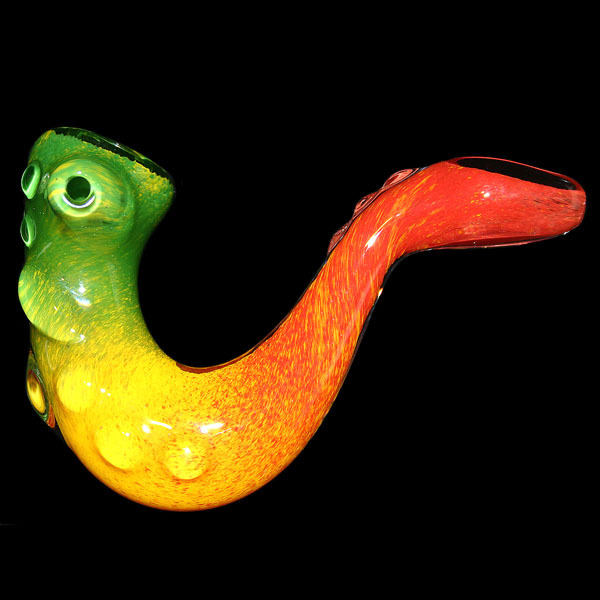 You get the classic color changing glass spoon pipe, which I’ve owned many versions of. These make much better smokers than wood or clay pipes, and they change color the older they get! They might look a bit phallic, but you can’t beat a classic. If you want something a little different, go for a color changing glass sherlock like this one. This is a funky red, gold and green sea critter, but Grass City’s Easy Bongs have pages and pages of these to browse, so go check them out. All of these color changing glass pipes are available from Easy Bongs, a Grass City store. They have by far the cheapest bongs and pipes, and they have thousands of cool things to choose from! Remember to check out the other Bongs I’ve reviewed. When you walk into a headshop, hand blown glass bongs are usually the most expensive items there. This isn’t just because they’re time consuming to make – they are widely known to give the smoothest bong hits. You could go for one of these sandblasted colored glass bongs – they’re cheap, sturdy and give great bong hits. My only problem with these is that they tend to look rotten after they’ve been smoked for a while. At only $16.60 though, this is one of those bongs that everybody should own. Another one of my favorites is this hand held round hand made glass bong with a marijuana leaf emblem. This little buddy fits right in your hand and delivers a long, smooth pull of smoke. For $14.70 there’s no cheaper way to impress the ladies. 1. Keep your bong stored above elbow level to avoid it being knocked off. That’s it – Happy Smoking! What do I need to Grow Marijuana? Here’s a list of the basic materials you will need to grow outdoor marijuana. Growing indoors is a bit more complicated, so we’ll deal with that after we’ve covered the basics. First, go have a look at the Grow Solutions Table at The Nirvana Shop. Scroll down to the outdoor marijuana growing table. You will see that there is a long list of products that they recommend. I’m not saying you need all of this stuff, but if you want to grow high quality outdoor marijuana (and it is possible), then I would recommend using some of their products. For a foolproof start to things, the first thing you need is the Germination Kit from Nirvana Shop. It costs 9 Euro, and it contains 10 pellets which protect and nourish your seedling weed plants. The first thing you need is pots and soil. Use 15 liter pots and a soil that has a pH of 6.0-7.0. This is vitally important. You can get soil pH testers at your local garden store. It is also important to keep monitoring the soil’s pH throughout the plant’s life to make sure it does not go wrong. If you go for smaller pots the roots of your cannabis plant will take up all the space available and will essentially drown and suffocate. They send their cannabis seeds through “stealth mail”, which apart from sounding cool means that you can’t be connected to the order. They usually deliver in under 10 days, and their seeds are very reliable. Sprout your seeds in cotton wool first. This is just to save you having to dig through soil to see if your seeds have germinated. Once they have sprouted plant them in a little hold the depth of one digit of your finger and cover them lightly with soil. After this you will need at least two different grow solutions. These should be a combination of micro nutrients and organic fertilizers that the plant needs during its development. Since the first stage of the plant’s life is concerned with growing stems and leaves, you’ll need a nitro fertilizer and a plant extract. Use the plant extract first (this can be any natural plant food) and the nitrate after the first month. The idea is that you need something to promote vegetative growth, and something to promote big buds on your marijuana plant. Earthworm humus liquid is very good for cannabis plants, but it is not entirely essential. It is important to keep the soil aerated though, otherwise your plants’ roots could become waterlogged. During the life of your plant you might need some other chemicals to fix various problems like iron deficiency and calcium imbalance. However, if you are just a casual grower these things should not be a problem unless they are killing your plant. Always feed your plant only water during the last week of flowering. Remember not to use any chemical pesticides, as these will destroy your THC yield. If your plant gets bugs, rather go for organic pesticides. If you have any serious concerns about your plant (yellowing leaves, weak stem, refusal to flower etc) you can consult the NEW grow problem solver at the Nirvana Shop. One more thing: If you are buying any items at a store that’s not online, remember never to use your credit card! Always pay cash, even for things like soil and pots, because if anything gets traced back to you and The Man starts connecting dots, your credit card records are going to be the first place they’ll look! Fortunately, this is less of a problem shopping online and buying items from overseas. Big Bud is the ultimate all-rounder of cannabis strains. It is a mixture of cannabis indica and cannabis sativa genes, and it is bred purely for yield volume. Despite this, Big Bud actually has quite a high THC content (8-15%) and produces a high that is a delicious mix of an all over buzz and a cerebral tingle. The photo to the right has been shrunk, but the coin in it is a quarter. Each Big Bud plant grows fairly tall (about 5 feet) and produces around 20-30 of buds that can be up to 12″ long! 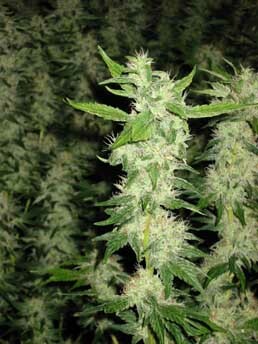 Big Bud is best grown indoors, but it can be easily grown outdoors. With a good hydroponics set up the buds on Big Bud can grow up to two feet in length, and each plant can produce nearly half a pound of highly potent marijuana. Big Bud is a remarkably pleasant cannabis strain to smoke, with a smooth herb taste and very mild smoke. If you want to buy Big Bud seeds and grow Big Bud yourself, it is a remarkably easy plant to grow and is recommended for your first time growing marijuana indoor. You can buy Big Bud seeds for around EUR 25.00 at The Nirvana Shop. Even if you live in the United States, don’t worry! The Big Bud seeds will be sent by discrete priority mail from a company that is not ‘The Nirvana Shop’, and you don’t need to worry about getting busted! All shipping is free and your big bud seeds should arrive within 7 days (allow slightly more for international delivery). Aurora Indica is a cannabis indica strain that has only existed for the last two decades or so. It is a cross between Northern Light and Afghan, two of the most chemically potent cannabis indica strains. Aurora Indica is not for the faint of heart, and produces a heavy all-over stoned feeling, nearly black hash and a pungent aroma. With a THC content sometimes exceeding 20%, this cannabis strain is highly potent and should not be taken lightly! The yield is not fantastic, only 14 ounces for a 1m squared sea of green, and the plants stay short. Aurora Indica seeds can be grown indoor or outdoor, but will do far better indoors. If you are going to spend the money and a href=”http://www.nirvana-shop.com/affiliate/scripts/click.php?a_aid=weedneeds&a_bid=11110001&desturl=http%3A%2F%2Fwww.nirvana-shop.com%2Findex.php%3Fdispatch%3Dproducts.view%26product_id%3D29807&#8243; target=”blank”>buy aurora indica seeds, you want to do them justice. You can buy aurora Indica Seeds from the Indoor Section of the Nirvana Shop for at ridiculously low prices. Shipping is free and all marijuana seeds are shipped in nondescript personal mail envelopes with no documentation linking you to the Nirvana Shop. It’s absolutely safe! Grow Outdoor Cannabis! The Season is Upon Us! All you people out there in the Southern Hemisphere, this is the Ganjafarmer reminding you that it’s time to plant if you want to grow outdoor marijuana this year! September is half over, so if you want to take advantage of the best sun, get your cannabis seeds in the ground. If you want to buy marijuana seeds online, this is the cheapest online cannabis seed bank. I recommend Hawaii x Maui Waui (left) or Durban Poison as both of these are easy easy to grow outdoor cannabis strains, and both produce high cannabis yield and have high THC content. Your cannabis seeds should take about a week to arrive. 2. Get Some Cannabis Plant Food! The little ladies have to eat, so get them an organic fertilizer like the Germination Kit while you’re at the Nirvana Shop – it’ll be a lot cheaper and more discrete than buying in a store, and they ship worldwide. Buy something general that you will be able to use for the life of your plant (except for the last week of flowering when you give it only water). For more info on what food to give your cannabis plant, check the Grow Solutions Table. It takes patience to grow outdoor cannabis. Water your cannabis plant every 2 days, when the top layer of soil dries out. Try to keep it in the sun for extended periods – they don’t like sudden changes in light! Keep an eye out for bugs or spots under the leaves, and treat them immediately with an organic pesticide. Chemicals will ruin your plants! Allow around 70 days for post-germination, 70 days for growing branches and leaves, and 70-100 days for flowering, depending on how impatient you are. Remember, if you leave planting cannabis seeds too late, or you let them flower for too long into the cold months it will have a drastic effect on the THC content! Good luck, and happy outdoor cannabis growing! Anyone who smokes cannabis should own a color changing bong at some point in their life. Not only are they great to look at, they grow and change with you and your buds, session after session. We’ve all seen color changing pipes and color changing chalices, but how often do you come across a full size color changing bong. At Grass City’s Easy Bongs they call it a Color Changing Bubbler, but we all know what these bad boys are. The color changing bong selection at Grass City’s Easy Bongs is pretty huge – they have 43 color changing bongs to choose from. Most of them are priced around $60-$190, which really isn’t a bad price range for a good quality color changing bong. So how do they work? Well, the term “color changing bong” might be a bit misleading. They are made of marbled glass with crazy colors shot through. Most are in wacky shapes to make them look even more alien. As you smoke them the resin builds up, and is only visible in the clear parts of the color changing bong. As you smoke more and more ganja through it it will change color based on what colors the color changing bong was in first place. Magic! At some point in your life you are likely to be subjected to a test for marijuana. This is a problem for us tokers, because marijuana stays in your body for at least 6 weeks after smoking. It hasn’t been six weeks since you last puffed the pipe, has it? I didn’t think so. How do They Test For Marijuana? The most common test for marijuana is the urine test, but blood or hair samples can also be taken. The best advice I can give you is you find yourself a home marijuana test kit, available at most local pharmacies. This will tell you whether or not your will pass a marijuana test. Help! I’m being tested for Marijuana! I know it looks nasty, but it’s only $24.95 and it’s absolutely guaranteed to make you pass a marijuana test, or your money back. They say that if you fail your test they will instantly refund your money – sounds good to me! You can also buy two and get one free, if you think you might have a lot of marijuana tests coming up. Northern Lights has a reputation for being one of the most potent cannabis Indica strains in the world. It is best to grow weed like this indoors, although you can grow northern lights outdoors. The plants produced by Northern Lights seeds have very compact buds, high flower to leaf ratios and are fairly resistant to diseases and parasites. Almost all of the world’s best Indica strains contain some Northern Lights genes. Northern Lights follows a typical growing pattern and typically takes around 7-9 months to flower completely. Flowering time is around 9 weeks. It has a THC content of between 15-20%, and produces a strong all-over heavily stoned feeling that can last for hours and make you laugh hysterically. Northern Lights is the amateur weed grower’s dream plant. It produces some of the best weed you will ever smoke, and it makes a lot of it. The smoke has a surprisingly neutral flavor, but the effect comes on slow. Wait a few minutes before you roll another one! You can buy Northern Lights seeds online at The Nirvana Shop.